and poor Nic who will get a box of store bought cookies today, but probably won't complain. I WANT to bake, but my jeans are begging me to stop. I have walked a million miles with anywhere from 7 to 13 pounds strapped to me. I have sweat and strained, but to no avail. I have to quit eating all those yummy things I love to bake. At least temporarily, until I get into a losing mode. So hang in there with me. I will be experimenting with some yummy lo fat recipes....whole wheat, high fiber whatever looks appealing. But for this week, no sweets, lots of exercise, a new attitude. But don't worry....I'll be back. About 10 minutes ago, it was officially fall. What a feeling. Temperatures dipping, okay, so dipping into the low 80's, but it's better than the 100 degree days of a month ago. It's my favorite time to bake and cook, but also my favorite time to work at Williams Sonoma. There's a revival of baking and cooking this time of year. It must be partly due to the intoxicating aromas of cinnamon and spices as well as the cool temperatures inside as well as out. Football season kicks into full gear, and everyone starts to anticipate the holidays. The store is beautiful right now. It lures you into baking, and makes it easy too. There's no rush yet, people really want to pause and enjoy the fall. There is only a week and change left in September, and I haven't baked a single apple anything. Friday night is Homecoming, so I'll bake Apple Pie Squares later in the week. 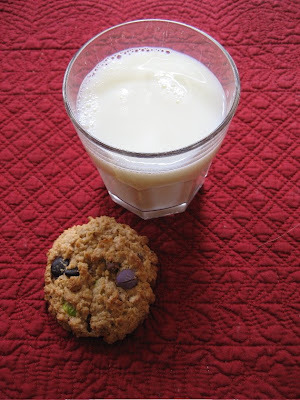 I have a great recipe for Apple Cookies that I may dig up too. But honestly, it's pumpkin that has me excited. Pumpkin creme brulee, pumpkin muffins with chocolate chunks, pumpkin chocolate chip cookies, so many ideas. Maybe even toasted pumpkin seeds this year. So now you know what October holds! The early part of this week however is devoted to house keeping. Stripping wallpaper, grocery shopping, errands. I hate when all that boring stuff gets in my way of the kitchen. Hold on, I will be back mixing it up! Happy Baking! Cookies, again? But it is fall! I love to volunteer. I love to bake. So when the church's "Angel Food" network called and needed help I said sure. She started asking for a veggie tray and dip. "Sorry", I interrupted. "is there anything they need that actually needs to cook?" So when she tentatively asked me to bake 4 dozen cookies, I was totally relieved. I can whip up 6 dozen (4 for church, 2 for us) in far less time than it takes to clean and slice veggies. And anyone who knows me, knows how I feel about veggie trays. Unsanitary, boring to eat, boring to make, give me a salad for my veggies and a chicken wing for an appetizer! So cookies.. I headed to the park yesterday for a brisk walk with Debbie Rocker. The temperature was 59 when I left the house. It had warmed nicely to 70 by the time I got home, but I was all about fall baking. I pulled out a trusty book called The All-American Cookie Book by Nancy Baggett. 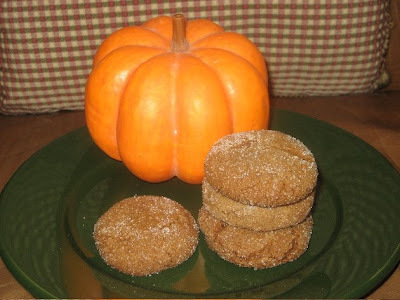 There is the recipe for Farmers' Favorite Molasses Cookies. I have a note written in the margin. In November 2005, Christina and I shopped at an outdoor mall. We went to Starbucks for coffee and shared a molasses cookie that was out of this world. I experimented with a few recipes and settled on this one. Molasses, ginger, cinnamon, it tastes like fall. I'd like to try it with brown sugar instead of white, but they are really perfect. 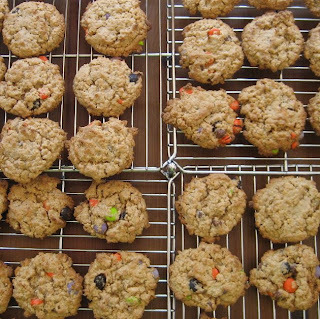 Don't over bake and they will stay soft inside, and they have a sugary, crunchy exterior. I can hardly wait for hot, spiced cider. Happy Baking! You couldn't pay me to be a teenager today. School is ultra competitive, sports are ultra competitive, and as usual the nice guy finishes last. I lived it with Nic and I'm living it with Christina. I know "the squeaky wheel gets the grease", and as I've told my kids for years, I don't squeak. I may have squeaked a little last night. I was pissed off, plain and simple. Why, where and who is trivial, but baking is the only answer. I was really gonna work on some good low fat alternatives for the blog, but maybe in another, calmer, time. I am not a chocoholic. I don't order chocolate desserts, or go for chocolate ice cream. I love bittersweet chocolate bars, especially Lindt with chile pepper (thanks Lori) and the yummy organic xxoo bars at Whole Foods. 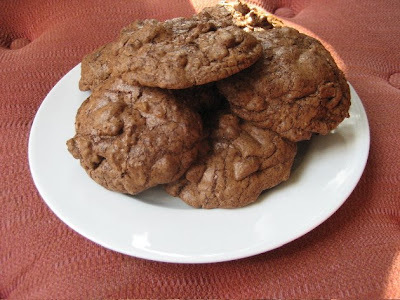 I think the reason these Pissed Off Sports Mom Chocolate Makes It Better cookies appeal to me is because they are dark chocolaty, and a little goes a long way. The espresso enhances the dark chocolate, keeps it from being too sweet. But, the salt is key, amazingly, you can taste it and the contrast with the creamy dark chocolate is divine. Use only sea salt, and you'll experience it too! This is an old recipe from a friend Julie Speelhoffer, that she shared after I bought my first (and only) food processor. Of course it is a Cuisinart, it is easily 15 years old, and I love it. 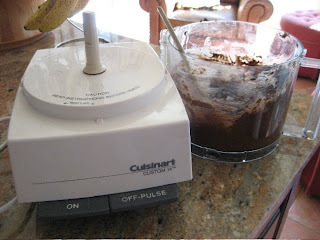 It isn't the first appliance to come to mind when you're making cookies, but it makes them so easily. Quick clean up, and a great little hunk of chocolate heaven! Process chocolate and sugar with steel blade for 2 minutes or until fine. Add butter, eggs, coffee and vanilla. Blend until fluffy. Scrape down sides. Add flour, chocolate chunks and salt. Process using on/off pulse until just combined. Do not over process. 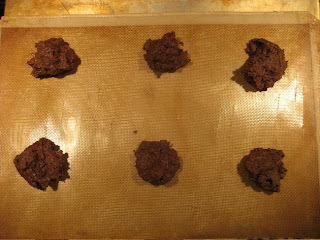 Mound dough onto sheets in 2-3 Tablespoon clumps about 2" apart. Bake 12 minutes at 350, rotating sheets halfway through. Cookies should be slightly firm to touch, but careful not to over bake. Cool on rack. It only takes one to find a more peaceful place. Happy Baking! And if you like this food processor business, check out Rose Levy Birnbaum's Christmas Cookie book. She has directions for almost all her cookies using a food processor. I've settled on M&M Monster Cookies. A recipe given to me by a gal I worked with one summer in my dad's offices, about 25 years ago, Tina Coyne. (Wonder where she is?) The cookies are full of stuff, have a peanut butter base, and are pretty dense. 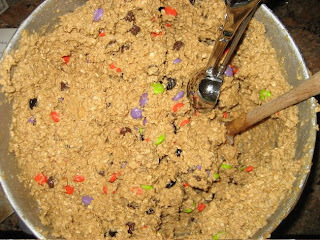 I remember the recipe making a large amount, so Scott and Christina will be happy to have some to eat as well. It has a pretty extensive list of ingredients, but no flour. Hmmm. I see a trend starting. (see peanut butter cookies from a few posts back). But it does take enormous amonts of oatmeal, peanut butter and eggs. It calls for a one-pound bag of M&Ms which I'm certain they sold 22 years ago. Now, however, you can only find a 14 ounce bag. I added a cup of milk chocolate chips to keep them full of stuff! The recipe makes 90+ cookies that are scooped with an ice cream scoop, so they are pretty big. Since it's September, I went with the seasonal M&Ms, which used to be boring brown, black and orange, but now have an addition of purple and lime green. Very Halloween-like. I used a medium size Italian made ice cream scoop sold at Williams Sonoma. These cookies aren't great made small. Size matters! Remember to move the sheets from front to back and upper shelf to middle shelf halfway through the baking time. Scott deemed these the best cookies in 22 years. Wow! I've made a lot of cookies in that time. Christina agreed they were great, but prefers oatmeal chocolate chip. I bagged them up, wrapped them in bubble wrap and shipped them Priority. I'm sure they will be loved in New Mexico! Happy Baking! So, we are preparing for a volleyball tourney in Chattanooga this weekend. The volleyball world is an interesting one. The teams, about 16, check in at the gym and are required to stay on premises the entire day. If matches go quicker than scheduled, everything gets moved up. So the prospect of 10 hour stretches in a gym are a little overwhelming. Many teams have wizened up. We pack coolers of good food to keep everyone nourished and happy, parents too. School concession stands are okay, but you don't get much energy from Nachos and Cheese Sauce! 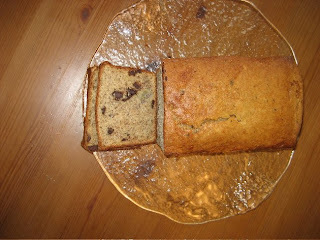 I have been travelling with Christina for a few years now, and my banana bread has earned a reputation. It's a great snack, nutritious, and easy to travel with. So yesterday with the relentless rain, I baked. Makes 1 loaf, Do not double, make it twice if you want 2! So the peanut butter cookies....I did indeed buy the Hershey's kisses. I did indeed make the cookies. The great thing about the cookies is that it takes one bowl. They mix up quickly and you can drop a couple dozen on 2 sheets in a matter of minutes. I plopped the kisses on top and tossed them in the oven. I set the timer and at 14 minutes they weren't quite done. So, instead of resetting the timer, I closed the oven door "for just another minute". Then I went and watched Greek with Christina. Well, there is nothing quite like a tennage drama to absorb your attention. About 25 minutes later, as we watched to see who would win the coveted Greek Week title, Christina asked what was burning. Needless to say they were inedible. I tossed them. I had no choice but to carefully wrap the Mexican Chocolate version, pack them in my suitcase and headed back to New Mexico the next morning. I couldn't show up empty handed, it would blemish my Sweetie Petitti reputation. The cookies were a hit. Now these boys have been eating cafeteria food for 3 weeks; no soda, no ice cream, no pizza, so anything may have been great. But they devoured them in a matter of minutes. They do not, however, travel well. They crumble very easily. Next week I will tackle a traveling cookie recipe for Nic and his friends. No more hand carried cookies, these will have to survive the U.S. Postal Service. This weekend's adventure takes me to Chattanooga. It is a volleyball weekend, and we are always looking for great snacks for the girls that are nutritous and delicious, and that the parents will enjoy as well. So, as Tropical Depression Gustav tries to squeeze out the last of the rain, it looks like a great day to bake. 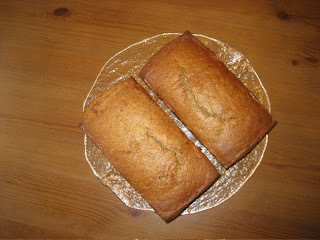 Banana bread, pumpkin bread and who knows what else.